Sink into your deluxe King four-poster bed, breathe deep as tropical breezes float through the plantation shutters and take a moment to completely unwind. With a balcony, kitchenette, plush linen armchairs, Wi-Fi, fans, air-conditioning and more, you’ll feel at home and utterly calm in no time at all! You could cross-check airlines, spend hours hunting for the best prices and try to cram all of your belongings into your carry-on bag, but why would you want to? Avoid the stress of arranging your own travel and let us do it for you! This deal includes return flights and 20kg of checked luggage per person—how good is that! The drive to Palm Cove is stunning. Tracing the coast, there’s dense bushland on one side and stunning views of the Pacific horizon on the other. Don’t miss a moment of Queensland’s northern beauty—enjoy transfers to and from the airport to take it all in and arrive at each end complete stress-free! Hungry? Start every day right with breakfast on us! Dine at the award-winning Reef House Restaurant to enjoy flavours and views. The restaurant is set under 300 year old Melaleuca trees and faces the Coral Sea. Embrace the serenity as get your fill of fresh continental favourites before a day of tropical bliss! See and do it all in Tropical North Queensland! With this exclusive My QLD Holiday Tour Voucher Booklet, you can get insider knowledge on the best local things to do. Enjoy amazing savings and discounts on a range of popular tours, activities and attractions and spend your money instead on souvenirs and extras! Kuranda Skyrail & Rail: Join Skyrail and marvel at the technology that has created the world’s most beautiful rainforest experience! Stop and view Barron Falls, learn more about the amazing eco-system or take a leisurely stroll along the rainforest boardwalk! Cape Tribulation – Daintree & Mossman Gorge: Be picked up by a professional driver/guide from the hotel for one of tropical Queensland’s most popular tours!! Experience breathtaking tropical rainforests, ancient plant life, crocodile spotting river cruise, unique wildlife and the spectacular Cape Tribulation. As a My QLD Holiday guest, you’re our VIP and we want to make sure that you know it! When the candles start to light the resort, enjoy exclusive access to sunset punch and canapes in the Brigadier’s Lounge. This daily offer is one of class and indulgence. Start your evenings right—you’re on holiday after all! Need to cool down? Nothing says “tropical escape” like refreshing sorbet by the pool! Set yourself up in the sun with a book, take a dip in the deep freshwater pool, then keep cool and recharge as you snack on your own frozen delight! Complimentary sorbet is served daily, so indulge your whole stay if you wish! 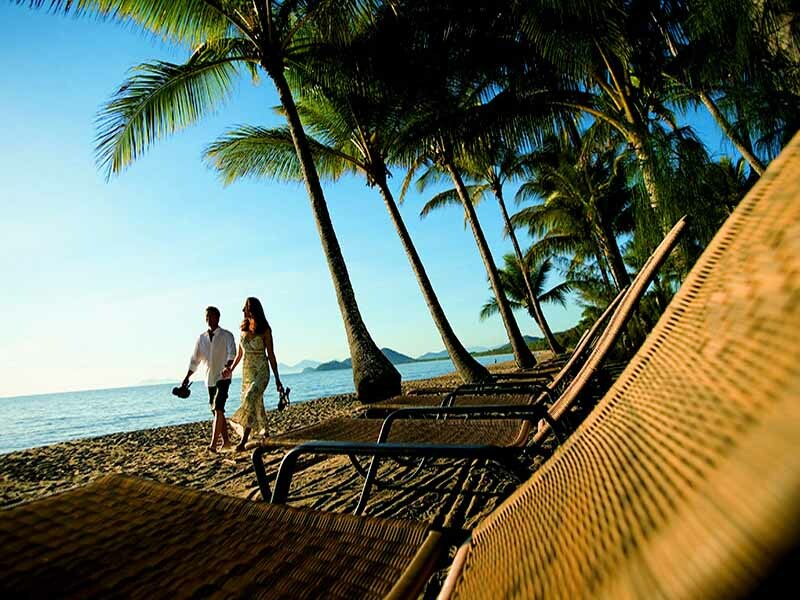 Get out and about to enjoy the best of Palm Cove. 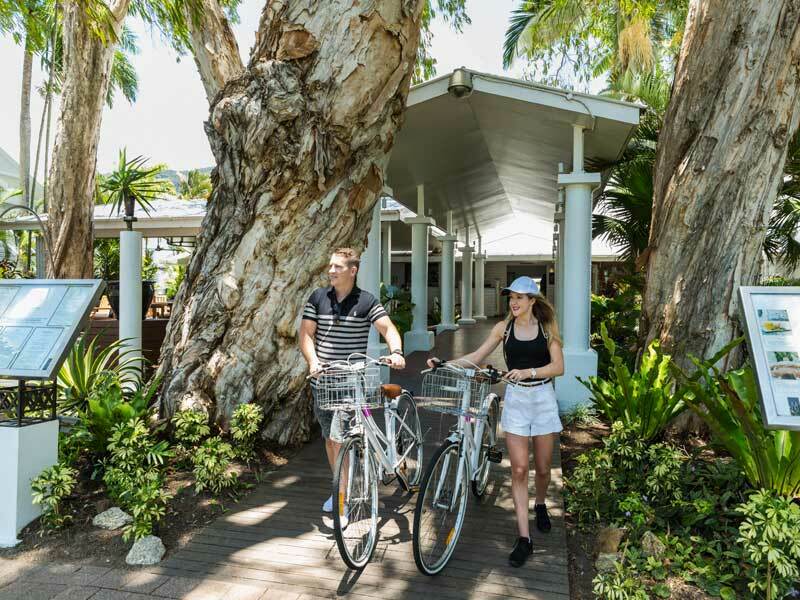 Cycle to discover cosmopolitan restaurants, bars and shops at Palm Cove Village, explore stretches of stunning beach or take to the water itself to snorkel or fish. Use the Reef House Resort equipment on tours out to the Great Barrier Reef or simply wander off shore! Feel refreshed from the moment you check-in. With a welcome drink and cold towel on arrival, you’ll be able to cool down and sink into the holiday spirit in no time at all! 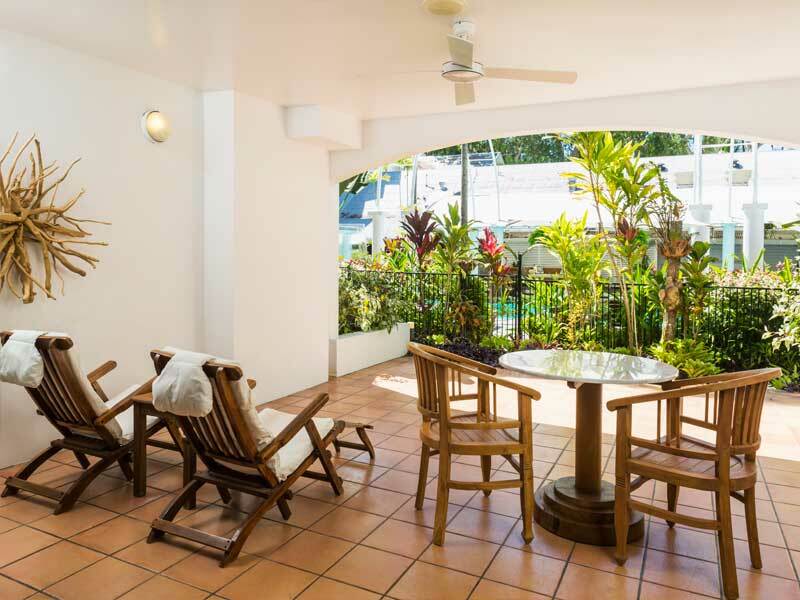 Wipe away any residual home or work stress than settle in for 5 nights of Palm Cove excellence without a care in the world! You will also find a complimentary bottle of water in room upon arrival. Soaking up the sun and exploring is great, but never underestimate the importance of some secluded down-time. Embrace the deluxe décor and comfort provided in your Verandah Room, curl up in the armchair and watch a movie, read a book or play a board game. Upload your holiday snaps with the WiFi and become the envy of your friends! Driving, or hiring a car for your holiday? Don’t worry about finding a parking space at the end of the day. There will be a designated undercover car park just for you awaiting your return each day. School holiday travel available at a surcharge, please call your friendly MyQLD consultant for a quote! Enjoy 53sq. metres of space and exquisitely unique artworks. These luxurious rooms feature a stunning four-poster King bed, bespoke carved bedheads and white plantation shutters looking out onto a private balcony. There is a dining set, mini kitchenette, separate luggage and vanity room, large LCD TV, ceiling fans, air-conditioning and more! The bathrooms feature a shower over the tubs and, on the first and second floors, boast double vanities or a powder room! Sink into comfy linen armchairs, access Wi-Fi or watch a DVD. These rooms can comfortably accommodate 2 guests. 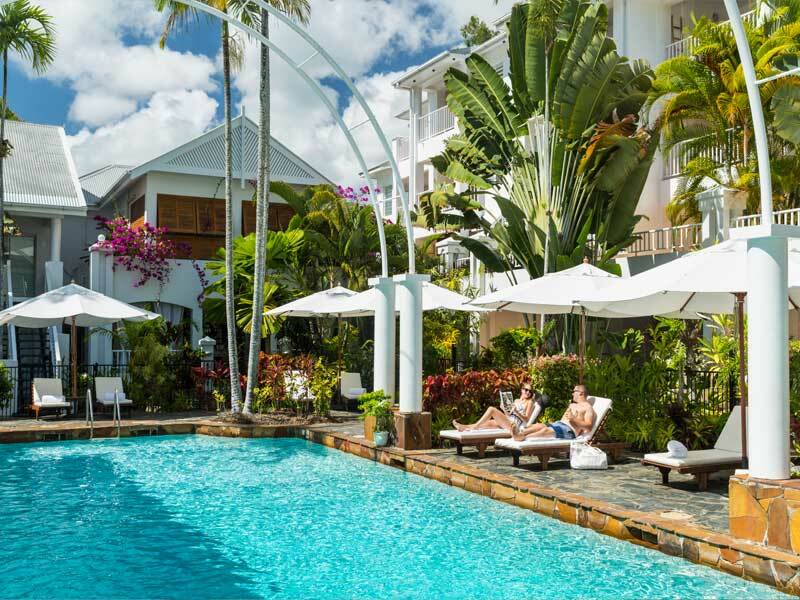 Verandah Spa Room – UPGRADE from only $150 per person! Upgrade your stay to the glorious Verandah Spa Room. With 66sq. metres of space, a private furnished balcony and outdoor couple’s spa, these rooms offer the chance to really indulge and unwind! Make the most of the tropical breezes with the outdoor entertaining area. This space includes a bar fridge and microwave and looks over tropical gardens. Sink into your deluxe King four-poster bed with bespoke carved bedhead and observe the tasteful, unique interior artwork. These rooms feature, a large LCD TV, ceiling fans, air-conditioning and spacious shower-over-tub bathrooms with double vanities on the first and second floors. They accommodated 2 guests. Let your love bloom in your Brigadier Beachfront Spa Room. Offering views across the Coral Sea, a private balcony with the resort’s signature ‘love seat’ swing and a deep King Spa bath inside, this is the perfect place for those looking to indulge and unwind! 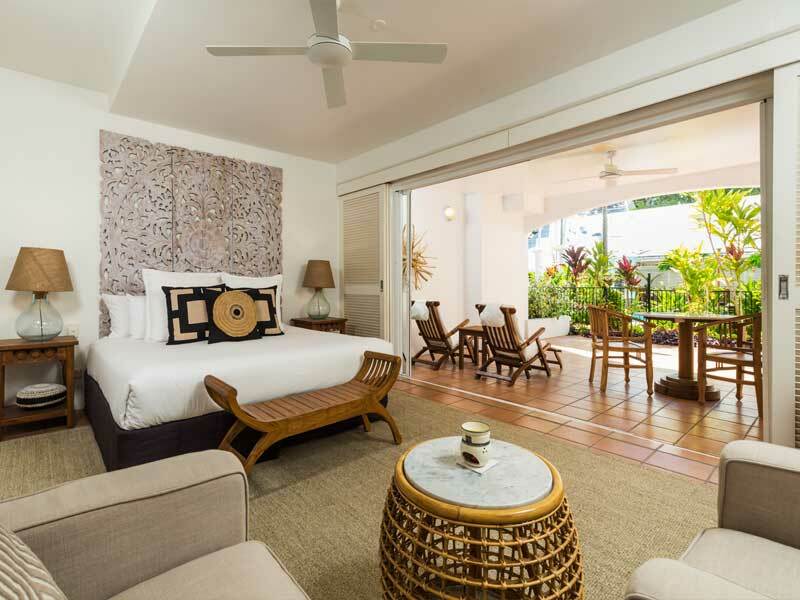 Sink into your plush King bed and drift off to sleep listening to the breeze and the tide, then wake to enjoy the splendour of your surroundings, including the South Pacific-inspired décor. 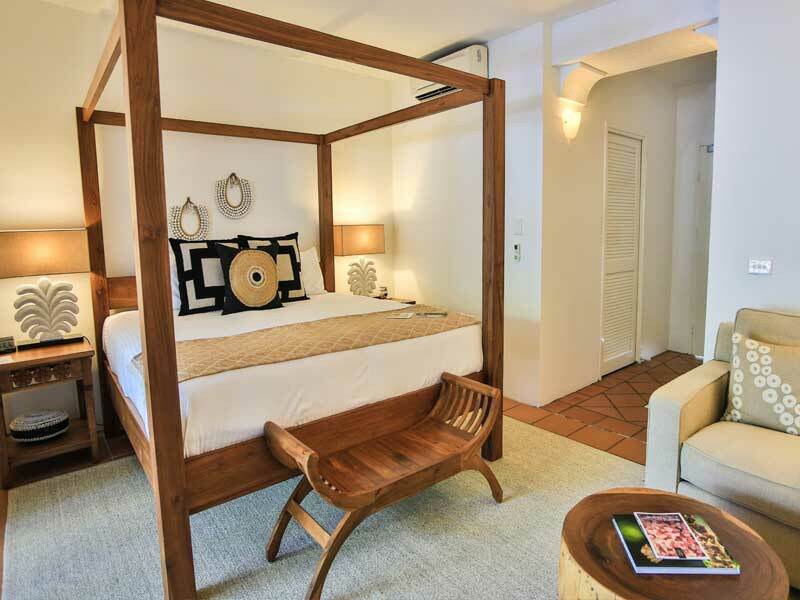 Brigadier Beachfront Spa Rooms boast 50.5sq. metres of space, free Wi-Fi, digital concierge services and exclusive access to the Honesty Bar (with daily House Guest privileges!). Feel refreshed under the rainfall shower, make use of the deluxe aromatherapy amenities and curl up together to enjoy a selection of books and DVDs from the resort’s collection. These rooms are ideal for 2 guests. Check-in to boutique luxury and forget the cares of the rest of the world. 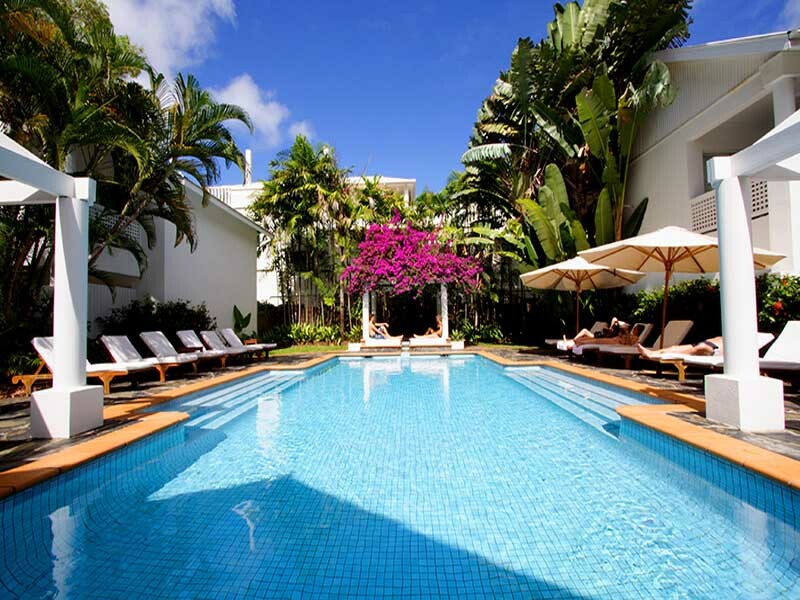 The Reef House Palm Cove – MGallery by Sofitel offers the perfect ambient, tranquil retreat. The stunning colonial building is open and light-filled, guests can enjoy stunning views of the ocean and the beach plus, with its Esplanade location, popular restaurants, bars, tours and attractions can be accessed with ease. Indulge in award-winning spa services, feast upon seasonal local produce at the signature Reef House Restaurant, enjoy canapes and drinks in the exclusive Brigadier David Thompson’s Honesty Bar and so much more! 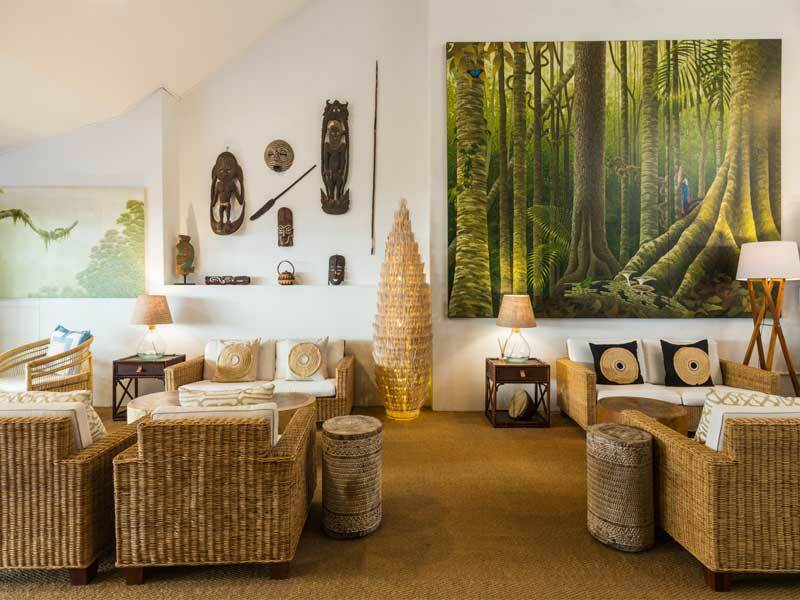 Read more about The Reef House Palm Cove – MGallery by Sofitel here! *Wine, Dine & Spa Credit: $350 to be credited to the guest’s room account on check-in which is made up of $200 for Wine and Dine and $150 Spa Credit. WDS Credit cannot be applied towards external third party service providers e.g. Tours. ~Cape Tribulation & Daintree:• Travel in air-conditioned comfort today in our luxury purpose-built vehicle on this eco-accredited tour led by our experienced and knowledgeable guides. 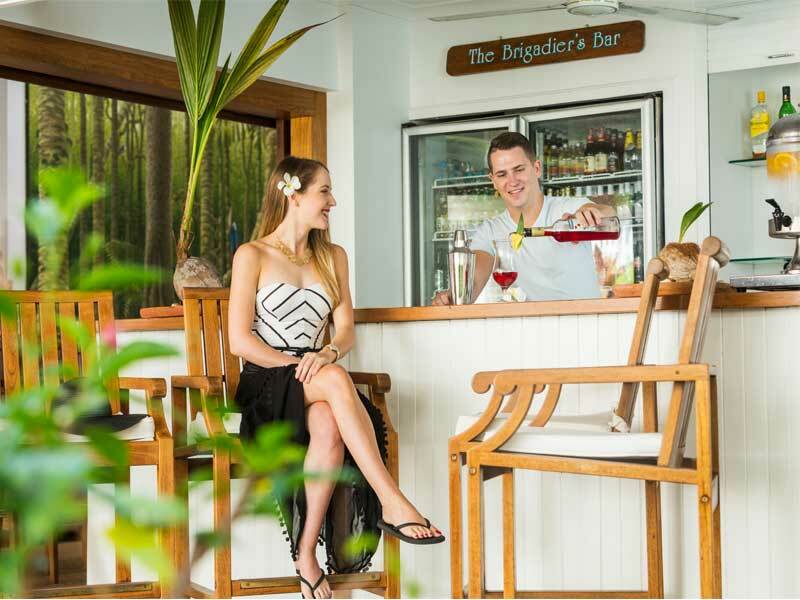 • Daintree Ice Cream Company: Stop for an afternoon refreshment included at the Daintree Ice Cream Company. Enjoy a delicious exotic fruit ice cream cup featuring four flavours (gluten free and dairy free options available).